The Angelina "Little Angel" is a handy, aluminum table-top easel. 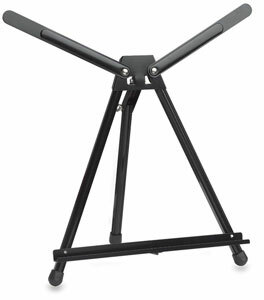 Truly versatile, it features angle adjustments and folding capabilities. One heavenly feature is the adjustable wings that support larger art or display materials. It also features a collapsible back leg. This easel is compact and portable — stow it in the included satchel with shoulder strap and take it with you.